There are three ways to publish a book. Traditional publishing is when you submit your manuscript to a publisher, and they decide whether or not they are interested in publishing your book. The general criteria in this case is whether they like your manuscript and are interested in investing their time, money and reputation. The publisher is listed as the publisher of your book. Subsidy and hybrid publishing is a form of self-publishing because you pay a company to be your publisher. Key provisions (see below) are negotiated with or controlled by the publisher. This publisher is listed as the publisher of your book and they manage the publishing process. The third method of publishing, also self-publishing, is to establish your own publishing company. The publisher is the name you have chosen for your publishing company—in publishing terms this is called a publishing imprint. It is similar to subsidy and hybrid publishing, but you have complete control. Whoever owns and controls the book’s ISBN—International Standard Book Number—is listed as the publisher. This has no bearing on copyright, which is unrelated to ISBN ownership. You do not need to set up an LLC or corporation, or even have a bank account in the name of your publishing imprint. Amazon’s CreateSpace used 62% of all ISBNs sold to small publishers in 2013 (the most recent year for which data is available). Books “published by CreateSpace” show the publisher name as CreateSpace Independent Publishing Platform. However, you do not need to use a free CreateSpace ISBN to use CreateSpace. Small and larger publishers alike use CreateSpace to print and distribute books to the Amazon stores. They simply use their own ISBN. Why own your ISBN? To protect your right to use any printer, avoid losing book reviews, improve book distribution and discovery and promote your brand. ISBNs are mandatory if you plan to sell a print book in a store. The other slices of the pie—Lulu, Author Solutions, Publish America, Outskirts—are those vanity or subsidy press publishers that you pay to publish your book, using their name as the publisher. The green slice labeled Author-Purchased ISBNs are the savvy authors and businesses that buy their own ISBN. The authors that owns their own ISBNs—or plans to—are AuthorImprints clients or prospective clients. We provide the same guidance and publishing services provided by all other companies in that pie, but you have complete control and ownership. Accounts are in your name, and you receive 100% of the royalties. There are no ongoing royalties or commissions paid to a third party. You own the copyright and all related rights. Books are printed at cost. You retain the rights to the files we create on your behalf. There is no charge to receive the source files. We manage the entire process so you don’t have to, from shaping your Word doc into a professionally designed print book and/or eBook, to distribution, to book launch. Ready to talk? Questions? Complete our contact form below to schedule a free book publishing call. Lee Van Ham and his co-founder established the OneEarth Project to further their mission of educating the public about sustainable economics. The principal way he has chosen to communicate his message is via a three book series. Considering his editorial mission, and the time and energy required to align it with another publisher, Lee decided to establish his own imprint. His first book was published in 2013. It soon caught the attention of a Korean publisher and it was published in 2016. AuthorImprints is also managing the publication of his second book in the series, Egos to Eden, due in 2017. Barbara Light Lacy is a “serial content developer” and publisher of Rising Times Books, a division of Golightly Publishing. Barbara has written or co-written five books, and recorded and produced two music CDs. 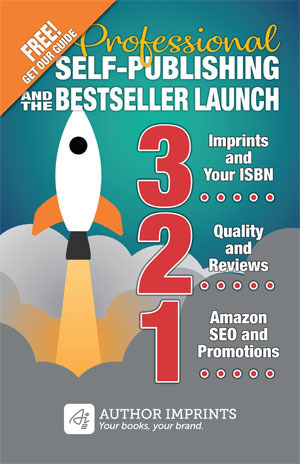 AuthorImprints provides all publishing services including book and eBook production, cover design, distribution set up and metadata optimization. We also managed the design and production of her music CDs using Amazon's CreateSpace. We continue to consult on the role and use of her imprint, and on the marketing of her books and CDs. Mark Feldmeir is the senior pastor at St. Andrew United Methodist Church in Highland Ranch, Colorado. After Mark's original publisher, Chalice Press, reverted the rights to his two traditionally published books, AuthorImprints republished the books with new covers, updated the text and optimized the revised metadata. We have since helped Mark publish his third book and have two more in development for future publication. Complete the form below to schedule a free project consult, or contact us now.